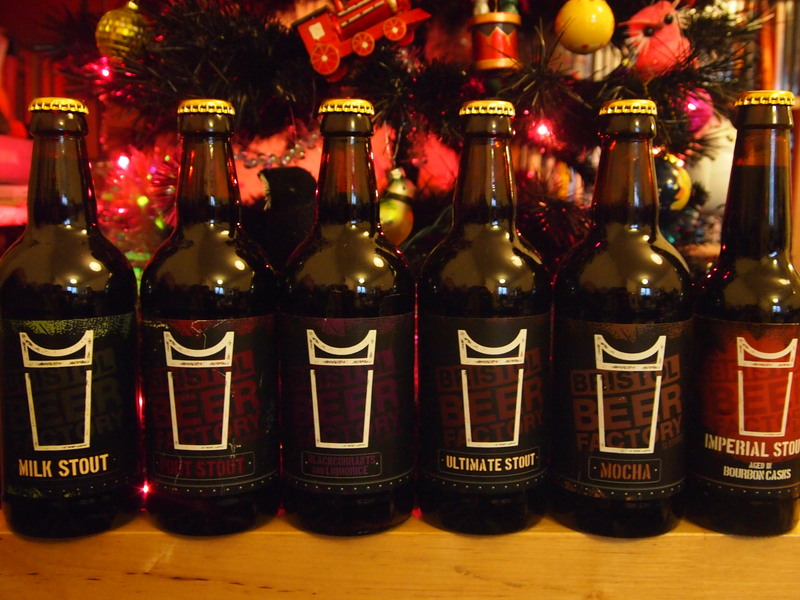 So it’s May and I’ve finally finished my 12 Stouts of Christmas from Bristol Beer Factory which means my reviews are complete! I’ve been treating myself to a bottle every now and then and writing a little review so sorry if some of it doesn’t make chronological sense! The more observant among you might also note that there isn’t actually 12 reviews! I have absolutely no idea why this is but at least it seems to be the more widely available ones I missed! Unfortunately, quite a few of these stouts may now be unavailable but I just thought they were still too good not to share. We can hopefully look forward to what they have up their sleeves next Christmas! Mocha (4.5%ABV) – According to the label, it contains ‘Coffee chosen with help from Extract Coffee Roasters – Hope Project Peaberry Espresso from Tanzania. It has notes of bitter/sweet dark chocolate and cherry fruitiness’ – There’s a really lovely big frothy head. The rich coffee aroma pounces out of the glass intertwined with unlit cigar. The thin mouthfeel emulates the characteristics of iced black coffee. The beans are dark-roasted, almost burnt but there’s a berry sweetness which balances out the bitterness perfectly. Ultimate (7.5%abv) needs no introduction. A satisfyingly thick mouthfeel, rich and velvety. It’s a fine example of a full-bodied, well rounded chocolaty stout with just the right amount of bitterness at the end. Port (5.5%ABV) – nice stout to round off Valentines Day. The port was specially selected by Avery’s Wine Merchants in Bristol and I assume was added to the beer at some point. There’s more chocolate than port on the nose and the bitter dark chocolate carries throughout the velvet richness of the flavor rounded out by a little vanilla and a lot of warming fruity porty-ness. Ultimate Raspberry (7.5%ABV) – The Ultimate Stout infused with fresh raspberries. The aroma takes me right back to summer, carrying punnets of beautiful fresh raspberries home from the farmers market, eating them out of the bag still warm from the sun. The bitterness and richness of the original Ultimate Stout is still there,but it’s got a jolt of sourness cutting through from those lovely sweet raspberries The bready malt almost makes me think of a raspberry jam sandwich in a glass. Smoked Chili Chipotle (5%ABV) – I love Chipotles so much that the OH and I actually home-brewed something like this last year. 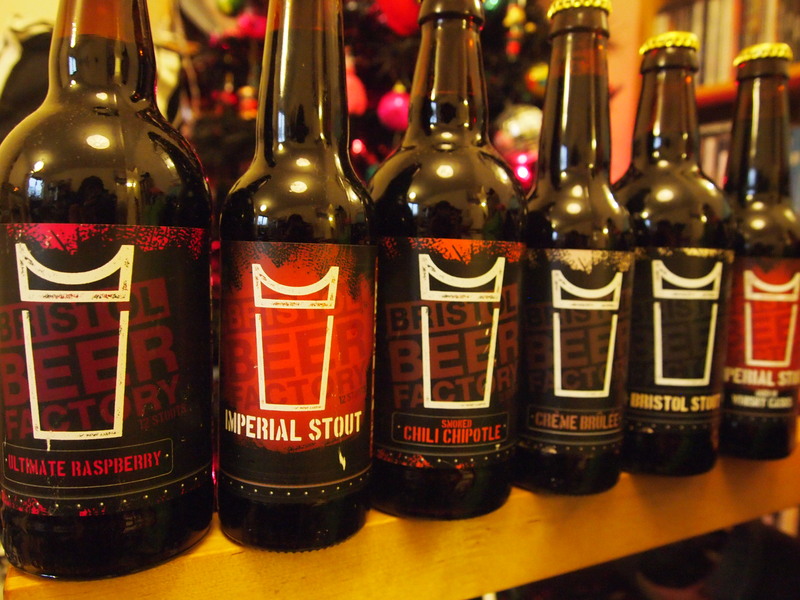 Chipotles are simply jalapeno chillis which have been dried over smoke so you have the lovely sweet chilli flavour with a warming kick combined with a rich smokiness which makes them a perfect addition to dark beer. This is not the most smokey or hot chipotle beer I have had (we used a lot of rauchmalt in ours!) but it’s pretty well-balanced and goes down smoothly with just a hint of heat at the back and a lovely sweet smoke with a touch of vanilla. The dryness at the end reminds me of the Irish style of stouts. Blackcurrant and Liquorice (5%ABV) – The brewery building in another life was actually a Ribena factory so I’ve been told so Blackcurrant seems a nice choice for a special addition. Do I imagine a hint of purple in the deep dark stouty brown? Possibly. The aroma was typical dark malt and a little vanilla and the flavor was pretty sweet with more of that bready malt and a little of that blackcurrant at the end which actually built up pleasantly with each sip. The end had a zingy tartness, almost like under-ripe blueberries and it was a little dry. I was a little disappointed that I couldn’t detect the liquorice but the yummy fruitiness made up for it. Imperial aged in Bourbon Casks (10.5%ABV) – Aged in oak bourbon casks for four months and, well, my goodness you can tell from the smooth rich flavor – so very well balanced and deliciously warm. The aroma is all dark sticky treacle and there’s a taste of dark dried fruit with a hint of oak and that familiar bourbon-breath sensation as you take a nice long breath out and relax. Imperial aged in Speyside Whisky casks (10.5%) Smokey, peaty and rich. Maybe a little too peaty for me since I’m not a big fan of that style of whisky but there’s also a little fruitiness which keeps me interested!. Imperial Stout (8.5%ABV) The original classic. Dark with a roasted, slightly smoked malt aroma. Satisfyingly thick and warmingly complex. Fruits, dark chocolate, burnt sugar and a hint of smoke make this an exceptional stout. Lip-smacking sticky with a short bitter finish. Creme Brulee (8.5%ABV) I’ve been saving this one! It was brewed with the legendary Melissa Cole who I was lucky enough to run into at the launch of the 12 stouts. Like the lady herself, this stout is simply a delight. Don’t expect to be able to stand a spoon in it as you can with the Southern TIer take on this classic desert. This stout is still a force to be reckoned with but it’s far more drinkable. It pours with a lovely light sandy-colored foam which lasts a while. The aroma is cafe au lait with a delicious waft of vanilla and the flavor is voluptuously yummy. There’s a dairy sweetness offset by oak and dark fruits as a result of the two months it spent aging in rum casks. The finish is long and sweet with only a mild bitterness. the 5% beers are all riffs on the dry stout; so good spot! What happened to the other bottles, did you not buy a 12-pack? I did but I can’t see the others in my beer ‘collection.’ Maybe I drank them without thinking – I buy the Milk Stout quite regularly anyway.